A geothermal system can also heat water. The sun shining on the earth warms the ground to maintain a relatively constant temperature of about 8 degrees Celsius year round in southern Ontario at a depth of 5 to 6 feet. Heat is extracted from the ground during the winter, or heat is discharged to the earth during the summer air conditioning season by one of four types of installations. If a horizontal loop system were installed, it would involve the excavation of parallel trenches, each 5 feet deep and 3 feet wide and about 130 to 150 feet long. The minimum distance between each channel is about 15 feet. All parallel trenches are connected to a supply and return header that enters the house through the basement to the geothermal flow center. The vertical loop would involve vertical boreholes 4 inches in diameter drilled about 150 feet each. Each borehole would be separated from the next by about 10 feet. Two ¾ inch polyethylene pipes are inserted into the 150-foot borehole. The tubes are connected at the bottom using a U-bend. Where ground water is abundant, a water well can also be used as the energy source/sink, reducing the installed cost by eliminating the closed loop. However, a return well or acceptable surface discharge is required. Also, an open loop system will require periodic cleaning of the heat exchanger to remove mineral deposits. This is regularly done once a year. A pond loop system consists of 300-foot coils of polyethylene pipe circuited in parallel via 1¼-inch polyethylene header pipes. The header and coil assembly is mounted on a PVC frame that holds the coils at the proper spacing and depth allowing water to flow underneath and through the center of each coil. The geothermal unit within the home looks similar to any other conventional heating and cooling system. Since heat removed from the home during the summer is discharged to the circulating loop solution, there is no outside condensing unit as required for other air conditioning systems. 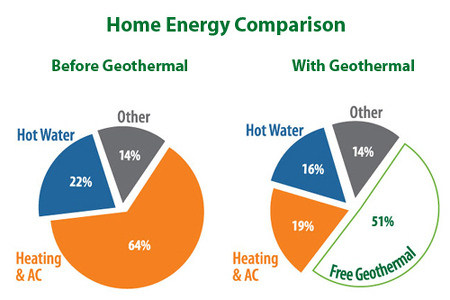 A geothermal system, apart from solar, is the most economical heating and cooling system available today. Because it uses free energy from the earth, its efficiency ratings are from 300% to 400% it is endorsed as having the least environmental impact and the lowest energy consumption. Geothermal energy systems result in a 40% to 80% operating cost reduction when compared to alternate heating and cooling systems. Both HVAC systems [forced air and geothermal] need to be designed to carry the amount of air required to operate efficiently and at maximum capacity. Generally, this is 400 CFM per ton of refrigeration capacity. A 3-ton air source system requires the same amount of air flow as a 3-ton geothermal system. Therefore, there is no difference in the initial ducting install costs between the two. Where the geothermal system install costs come into play is the equipment costs and loop installation. While ordinary high-efficiency furnace costs around $1500 in Southern Ontario, the geothermal furnace will cost at least five times as much or more, depending on the make and capacity. Also, more labor is required to install loops of plastic pipe 5 feet below ground. Drilling and excavation costs are also extra. Since the HVAC industry has undergone drastic price changes in recent years, it is very hard to determine the exact costs between geothermal and forced air heating. Code changes now require higher efficiency systems, greater insulation values on the duct systems and a host of other items that affect the bottom line. Refrigerant prices continue to rise. So does fuel costs, labor rates, operating costs, etc. The best estimate we can come up with is that all other things being equal, a geothermal system built in a typical 1700 sq.ft bungalow will cost approximately $15,000 more than forced air system. Now, is a geothermal system worth the additional cost? How much are your energy bills at present? Typically, a geothermal system will have a payback period of 10-15 years between the cost of installing a high-efficiency air source system versus a geothermal system. If you are going to install a geothermal system and move from the home within that time frame, you probably will not experience any energy savings. Also, consider that the national life expectancy of an air source system is 15-20 years before the system will have to be replaced. Geothermal systems typically have more than a 30-year life expectancy. Let’s consider the effects of installing a geothermal system. There are around 1,000,000 geothermal systems installed in the North America to date saving more than 21,000,000 barrels of crude oil each year! Replacing an existing fossil fuel burning appliance further reduces Co2 emissions and reduces our dependency on foreign crude increasing our national security. Reduces the energy requirements on our power grids, which are already substantially overloaded as evident by rolling blackouts. Lower operating costs – Operates more efficiently than ordinary heating and air conditioning systems, saving up to 80% in most cases. Quiet operation – A super efficient compressor and soft-start, variable-speed fan make the Premier line so quiet that many people find themselves checking to make sure the system is actually on. Comfortable – Provides precise distribution of warmer air in winter. Gone are the uneven temperatures experienced with conventional furnaces. In the summer, you get central air conditioning with better dehumidification. Attractive – The completely self-contained unit is maintained indoors. There is no need for noisy, unsightly, outdoor condensing equipment.